The start of the third and final day of the Laver Cup saw play start an hour early with four matches scheduled for a single session (the previous two days had been split into an afternoon and evening session each day). Team World staring down the barrel of a 3-9 deficit overnight needed strong play early on Day 3 to keep the chance of overall victory alive. Team World got off to a strong start with an inspiring doubles victory over Team Europe, thereby narrowing the gap to 6-9. Then, in the first of three singles matches of the day, Team Europe’s young gun Alexander Zverev made like work of Sam Querrey dispatching him in straight sets. Team Europe was now only one win away from putting their hands on the Laver Cup. The man tasked with bringing the Laver Cup into European hands was none other than world no.1 Rafael Nadal. However, he could not do it. Team World’s John Isner beat the world no.1 on the back of an impeccable serving display. This left the scoreboard at 12-9 in favour of Team Europe, with one scheduled singles match left for the day – Federer v Kyrgios. Put simply the Federer v Kyrgios match was awesome. Kyrgios was playing out of his skin, dictating play and the general rhythm of match. Kyrgios took the first set, could have won the second and was closing in on victory in the third set match tiebreaker only to be defeated at the last moment by Federer. 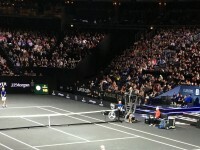 As Federer edged closer and closer to claiming the Laver Cup for Team Europe, the packed O2 Arena crowd got louder and louder until screams of elation were heard as Federer sealed victory 11-9 in the match tiebreaker. This gave Team Europe an overall 15-9 victory over Team World allowing them to claim the first ever Laver Cup. It was quite a day of tennis and an amazing three days of tennis overall with sold-out crowds each day at the 02 Arena in Prague. 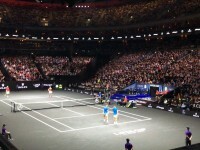 Fans in the stadium and watching on TV were able to see some of the best tennis players on the planet doing battle each day to try and claim the Laver Cup. After all was said and done, Team Europe prevailed in a tightly fought and enthralling contest, congratulations Team Europe. During the post-match award ceremony it was announced that the 2018 edition of the tournament will take place in Chicago at the world famous United Center. 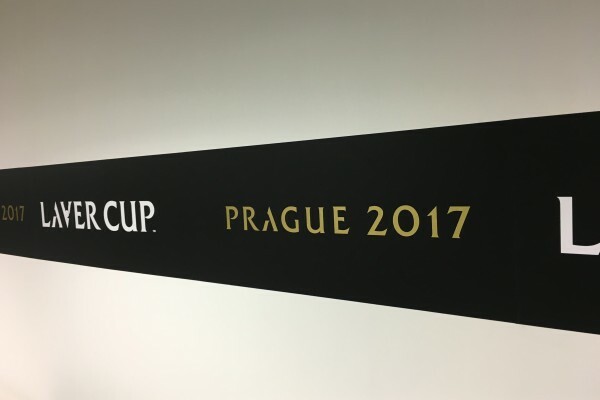 If the Prague edition of the Laver Cup is any indication and with the potential for current injured stars like Djokovic, Murray and Nishikori to play next year, the 2018 Laver Cup will be a much sought after event for tennis fans to attend. See you in Chicago in 2018 for the next edition of the Laver Cup!